Chinese smartphone maker Xiaomi’s Mi A1 device emits the highest level of radiation, which is followed by OnePlus 5T. This is based on research conducted by the German Federal Office for Radiation Protection. 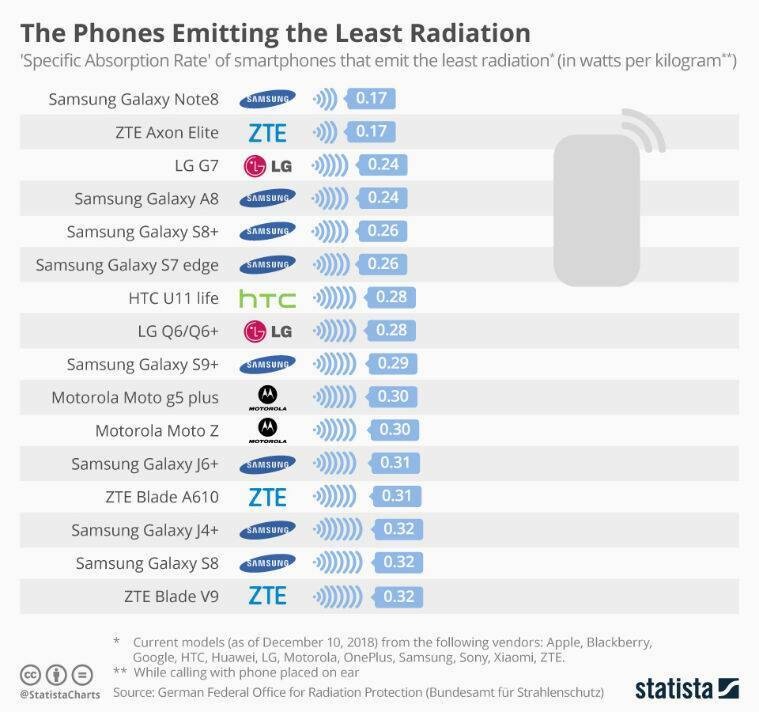 Based on the data provided by the German body, Statista made two lists of top 16 smartphones emitting the most radiation and the least radiation. When it comes to Specific Absorption Rate (SAR) value or radiation emitted by phones, the maximum acceptable value is around 1.6 W per kg. A lower SAR rating indicates lower radiation being emitted. 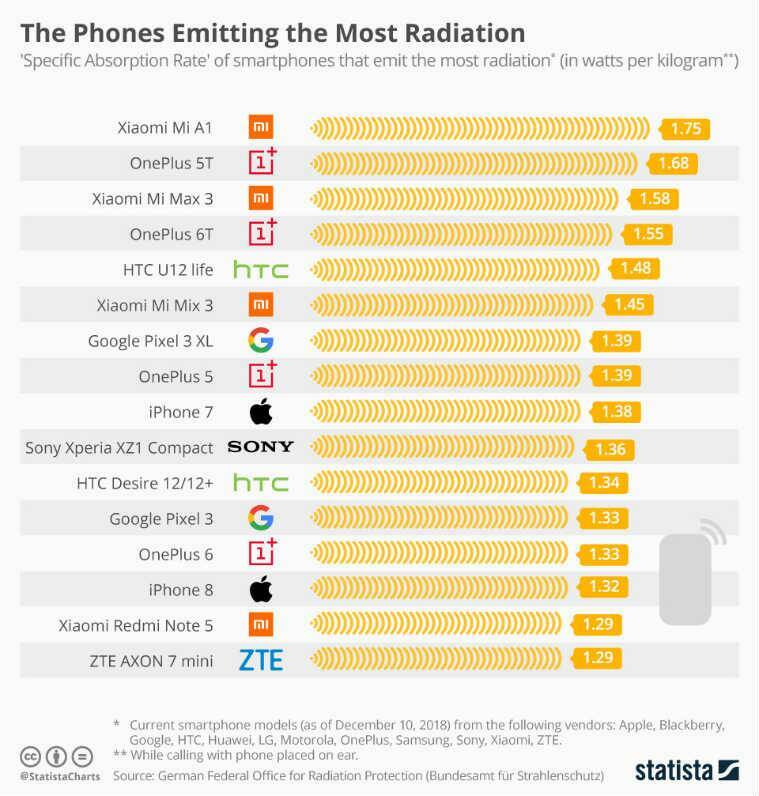 While Xiaomi and OnePlus devices dominate the list of phones emitting the highest radiation, Samsung phones are found mostly in the least radiation list. Statista clarifies that while there isn’t any universal guideline for a safe level of phone radiation, the German certification for environmental friendliness called ‘Der Blaue Engel’ or Blue Angel only certifies models that have a specific absorption rate of 0.60 watts per kilogram or less. Topping the chart of phones with the highest radiation levels, Xiaomi Mi A1 emits a specific absorption rate of 1.74 watts per kilogram, which is slightly higher than the 1.6W per kg that is seen as the standard. Coming in second place, OnePlus 5T has an absorption rate of 1.68 watts per kilogram. Another Xiaomi phone, Mi Max 3 takes the third spot with a specific absorption rate of 1.58 watts per kilogram, whereas OnePlus 6T sits on the fourth number with a specific absorption rate of 1.55 watts per kilogram. Apart from above-mentioned models, Xiaomi Redmi Note 5 (1.29), OnePlus 5 (1.39) and OnePlus 6 (1.33) also make it to the list. The list also includes the iPhone 7 with a specific absorption rate of 1.38 watts per kilogram and iPhone 8 with a specific absorption rate of 1.32 watts per kilogram. The list of 16 devices goes on to include Google’s flagship devices– Pixel 3 XL (1.39) and Pixel 3 (1.33) as well. Statista also compiled the list of phones emitting the least radiation based on the German body’s data. With eight models in top 16, the list is dominated by Samsung devices with Galaxy Note 8 at the top with a specific absorption rate of 0.17 watts per kilograms. Other Samsung smartphones in the list include Galaxy A8 (0.24), Galaxy S8+ (0.26), Galaxy S7 Edge (0.26), Galaxy S9+ (0.29), Galaxy J6+ (0.31), Galaxy J4+ (0.32) and Galaxy S8 (0.32). The list also includes models like ZTE Axon Elite on the second spot with a specific absorption rate of 0.17 watts per kilograms and LG G7 ThinQ on the third spot with a specific absorption rate of 0.24 watts per kilograms. HTC U11 Life (0.28), LG Q6/Q6+ (0.28), Moto G5 Plus (0.30), Moto Z (0.30) also make it to the list of least radiation emitting devices. The complete database of phones and their radiation limits made by the German Federal Office for Radiation Protection can be accessed here. You can check the radiation levels of the device you own by searching it on the page.